Why Did Madoff Do It? That's what I heard while watching Kudlow's show today. It was said by an older gentleman who said that he's looked at 100 years of American stock market returns. He expects the next 100 years to be more of the same. He brought up the Great Depression and the World Wars. He said we'd been through hard times before and that nothing has changed. Here are some changes that are apparently deemed insignificant when looking at a simplistic chart of historical stock market returns. 1. 100 years ago we did not speak of non-farm payrolls. Fewer people are actually needed in the farming industry these days. Capitalism continues to automate jobs away (read link at own risk, very disturbing). 2. 100 years ago we did not speak of Made in China. If you picked up a random item in your house it was most likely manufactured in the United States. Globalization continues to outsource our jobs away. We simply cannot compete with billions of people who will work for far less money than we will. Our solution? Let them. 3. 100 years ago we did not have an unsustainable trade deficit. That's what happens when we send freshly printed paper money overseas in exchange for real goods. 4. 100 years ago we did not rely on imported oil. We did not rely on the Middle East. We were not fighting a war in Iraq. We were not reading about China-Iran Gas Deals. 5. 100 years ago we were on a gold standard. In 1933, we fell off of it a little bit and in 1971 we fell off of it the rest of the way. We simply could not afford to stay on it. We certainly won't be able to fall off of it again in order to boost our economy. We're done. 6. 100 years ago we had more common sense. I am basing this opinion on one simple theory. If we were using the same level of common sense back then as we are currently using, then we surely would not have had 100 years of prosperity. The Future of Investing: Evolution or Revolution? What then does commonsense tell us about future asset returns? Let’s revisit our previous conclusions on the developing environment for some clues. They include: delevering, deglobalization, reregulation leading to slow global growth, a heightened risk aversion, a distrust of conventional investment model portfolios, and a greater emphasis on surviving as opposed to thriving. If valid, then an investor or an investment committee would likely stress the bird in the hand – as opposed to the one in the bush; stable and secure income – as opposed to uncertain capital gains; a government-regulated utility model – as opposed to innovative yet risky venture capital investments. 2. "Distrust of conventional investment model portfolios"
3. "Greater emphasis on surviving as opposed to thriving"
4. "Bird in the hand"
5. "Stable and secure income"
Further, this is not a cyclical change in my behavior. It is a permanent secular change. I'm retired. I simply can't afford to risk my nest egg on long-shots. Worse, using hindsight I was actually rewarded for the behavior change. I did not expect to be. 2004 to 2009 was a horrible era for taking on extra risk, trusting conventional investment model portfolios, emphasizing thriving over surviving, and levering up some seriously volatile and risky income. Put another way, about the only investors who managed to get two birds from Bush's economy were those who shorted the heck out of it. I'm just as bearish now as I was 5 years ago. Here's my reasoning in three words or less. March 31 (Bloomberg) -- The U.S. government and the Federal Reserve have spent, lent or committed $12.8 trillion, an amount that approaches the value of everything produced in the country last year, to stem the longest recession since the 1930s. You will note that the $12.8 trillion doesn't address any of my structural change issues (even in the slightest). All it does is help patch up existing holes in our Titanic. We will continue to automate jobs away. We will continue to buy goods made in China. We will continue to have an unsustainable trade deficit. We will continue to rely on imported oil. We will continue to abuse our faith based currency ($12.8 trillion does a very good job of that!). We will continue to lack common sense. That's my bearish opinion, and I'm sticking to it. I'm not a religious person, but seriously, heaven help us all. "Some of the widely followed indexes such as Case-Shiller, OFHEO, NAR and so on are way too broad to be meaningful," said Sklarz, the Honolulu-based president of Collateral Analytics as well as a co-founder of Collateral Intelligence. "To properly track the real estate market you really need to get down to all the local markets," Sklarz said. "Now we have the tools to properly track that. So why track these overly simplistic indicators that can be very biased, as they are in the current environment, when there's so many more complicated things going on in the market?" Similarly, the consumer price index is way too broad to be meaningful. To properly track inflation you really need to get down to the individual products. The price is holding steady. There's no inflation or deflation. Hurray! I'm a big believer in anti-conventional wisdom thinking and right now it isn't looking good, not good at all. First, I want to go back in time. After 30 years trying to defy economic gravity, the US is well on the way to becoming the world's largest banana republic. I obviously believed it was possible, or I wouldn't have quoted it. So let's see how we are doing. Let's back up a paragraph or two. Above all, there is arrogance. Arrogance not only on a personal level, but on a systemic level…that this system is the “cause” of our prosperity, and that the world “needs” our dollars. If you've been reading this blog then you surely know that I agree. Oh crap. To fight against the risk that inflation will erode the value of your money, advisers typically suggest people put a substantial portion of their savings in stocks. But Bodie challenges that thinking. "Conventional wisdom is wrong," he said. Stocks were the only way to try to keep ahead of inflation in the past, but since the government started selling TIPS in 1997, the safe bonds help fight inflation risks. We can't prove that conventional wisdom is currently wrong, but we can prove that it was wrong in the year 2000. The I-Bonds I bought in April, 2000 paid 3.4% over inflation. As of March, 2009 they have compounded a 74% gain and continue to earn interest tax-deferred for up to 21 more years. Meanwhile, the Nasdaq was 3,860 in April of 2000. It is now 1,545. That's a 60% loss. In summary, that's $1.74 for each dollar invested in I-Bonds vs. just 40 cents in Nasdaq stock. Safe did more than just win. It slaughtered risk (by a factor of four). Here's the scary part. There wasn't even all that much inflation. Just imagine what would happen if inflation did actually pick up. Picture what would happen to the stock market with inflation at 15%, interest rates at 15%, and "safe" TIPS earning 17% (2% over inflation). I doubt very much it would be pretty, any more than it was in the 1970s. For example, how would restaurant stocks perform in such a scary environment? Who would eat out? It sure won't be me. I'll be too busy resupplying the "Apocalypse Pantry". Let's assume for the moment that our government won't allow 1970s level inflation to happen again. It is suggested that 15% inflation would ruin this economy and is therefore simply not an option. I am certainly willing to entertain this theory, mainly because I agree with the reasoning. Whether or not the government can stop it from happening is still open for debate. I tend to think of this differently than most it seems. In the past, inflation was an option. I'm now told that inflation can't be an option. That tells me that we now have fewer options. Having fewer options is always bad. We've literally painted ourselves into a corner. We need inflation to bail us out, yet we can't use it? And that's a good thing? I would point to our current situation and what got us here. Inflation was rising. Inflation was not an option. Interest rates were therefore held up until something broke, and sure enough something did break. That thing was everything. The entire global economy broke. As an extrapolator, I would argue that inflation will rise again someday but if inflation isn't going to be an option, then something will break again, and again, and again. That environment is even worse for stocks. Further, if that new cycle continues then at some point the economy will be so weak that it will be impossible to actually stop inflation. We'll be stuck with stagflation. We'll need to raise interest rates to stop inflation but we'll also need to lower interest rates to create jobs. That's when I would argue that the metamorphosis into a true banana republic will be complete. That's why I am a long-term stagflationist. It might not happen on this cycle, or the next cycle, but at some point I do think we'll get there if we keep trying to use debt and printing presses to solve all of our structural problems. Conventional wisdom holds that the way out of the “recession” is to spend our way out of it. A trillion dollar stimulus package is being touted by the pundits as the right way to "shock the economy" (I suppose the economy is just in a coma, and merely needs awakening) into growth again. According to Pablo Galarza of Money, "His 1994 book Stocks for the Long Run sealed the conventional wisdom that most of us should be in the stock market." Jeremy Siegel, at first you were elated when you pulled out the economy's dipstick and it showed that the car was actually creating extra oil. Unfortunately, it wasn't oil at all. The excess was simply water leaking in from the radiator. I'm sorry. You've blown a conventional wisdom head gasket. There's also a problem with your timing belt. A few weeks in the shop and we'll have it as good as new for you though. In addition, Yale economist Robert Shiller, who wrote Irrational Exuberance (Princeton, 2000) warns that even a 20 or 30 year holding period is not necessarily risk free. This is because the 20th century, on which many of Siegel's conclusions are based, was the most economically successful century in the short history of the United States and will not necessarily repeat itself. Head Gasket, Blown, Is this serious? It is because (1) it will be expensive to replace, (2) it is probably the result of some other underlying problem, and (3) additional repairs may be required in addition to replacing the head gasket itself. That pretty much sums up our economy these days. Don't you think? We're spending trillions of dollars on repairs. There is another underlying problem that is often conveniently ignored (we're sending vast amounts of our money to China so that they can all drive cars just like we do someday, at least in theory). And lastly, additional repairs will be required. In fact, the repairs themselves will need repairing. Think TARP, TARP II, TARP III, and so on. Q. I've heard horror stories about broken timing belts. What's the straight Scoop? The biggest issue with failed timing belts on Fiats is the catastrophic damage that can occur. This also applies to fiat currencies. Usually, a fiat-money currency loses value once the government which acts as the issuer refuses to further guarantee its value through taxation, but a strong private banking system and consensus of the population may prevent this. Wow. Pardon my language, but we're screwed. I'm fairly certain we don't have a strong private banking system nor do we have a consensus of the population. In fact, those in debt seem very responsive to the idea that inflation can actually save us. If soaring debt service costs causes the government to increase inflation, selling the policy may be an easier sell than one might think, since the government isn't the only habitual debtor. The American people have been amassing piles of debt for years, on credit and in the form of instruments such as home mortgages. In fact, it was those home mortgages that have kept the economy afloat to the extent that it is today. We managed to get oil to $147 a barrel just by hinting that inflation might be an option. Imagine what the price of oil would hit if we did more than hint. There would be vast unintended consequences. But if the price of oil rebounds, the potential payoff is big: the federal government estimates 800 billion barrels of oil, triple the known reserves of Saudi Arabia, lie under the Rocky Mountain West. For now, the energy companies are not using most of the water they've claimed; they're leasing some of it to other users, most often farmers. But they are stocking up on water rights to be sure they won't be caught short. The US government believes, correctly or incorrectly (and this is the key point), that the problem with the US economy is that people have stopped buying things, and this is because they cannot borrow the money to make those purchases. This seems to completely ignore the fact that reckless borrowing and subsequent spending is what got the United States into the economic problem in the first place. One way to reduce the overall debt burden is to create inflation by printing more money. 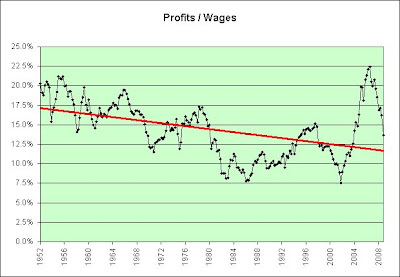 If inflation starts going up, nominal wages will also rise, creating more money to pay off debt. Imagine if your income suddenly increased by 10 percent but all prices increased also. You would have more cash to pay off your credit card because that balance would not go up. With inflation, all wages and prices will rise and the purchasing power will go down, but the debt level will drop. And that is already happening. Oil is up from $35 to $55. So you’d think that as long as Geithner is shooting craps at one table, the president might not want to bet the rest of the family income at the roulette wheel. But this is an administration that sees “opportunity” in crisis. "You're talking about opening up all kinds of gambling to the young, to the highest risk gambling groups," Pat Fowler, Executive Director of the Florida Council on Compulsive Gambling told the Tallahassee Bureau, "The majority of them don't have a real grip on finances and a budget." Too bad we couldn't have stopped all this wild risk taking by the young before it reached this point. AIG didn't suddenly change its culture that day its former chairman and CEO Maurice "Hank" Greenberg was pushed out the door. But now, two years after his departure, it's certainly a story yet-to-be told about his legacy--the AIG culture and the AIG business strategy and losing its CEO of more than 40 years. If current earnings are any example, for sure the company continues to prosper and prosper mightily. Meanwhile, there is no stopping Greenberg. How do you interview an 80-something legend? AIG required a legendary bailout. In hindsight, you could start with that. But in a prime time interview to be aired on the the CBS 60 Minutes program in the US, Professor Greenspan admits that he did not see the subprime crisis coming until it was too late - despite evidence of questionable lending practices that saw risky loans given to high risk low income people. Subprime smells never seem to bother the person who creates them, lol. The caution flag is out. Bernard Madoff is head of the marketmaking firm Madoff & Co. and also chairman of the trading committee for the Securities Industry Association. He's urging on-line brokers to tell their clients that highly volatile stocks like Amazon and Yahoo are likely to face a severe lack of liquidity during a downturn or a prick in the Internet stock bubble. "The problem is, there is no buffer between the customer and his own tools of self-destruction," says Madoff. There also needed to be a buffer between the customer and Madoff's tools of self-destruction. Citigroup chief Charles Prince resigned at a board meeting 04 November 2007, paying personally for the world's top banking group's poor performance in the subprime mortgage crisis. That being said, I do believe that the young really are the risk takers though. Unfortunately, the older among us feel the need to be the risk givers. It's sort of a Feng Shui approach to financial balance. Put another way, for each person who yins, someone is going to need to be seriously yanged. If we’re going to spend our grandchildren’s money to fix a problem we created, most of it should be spent on things that will benefit them. The 26 percent decline of the pound against the dollar and 16 percent drop against the euro over the last 12 months failed to spur demand for British exports, and instead left many British consumers paying more for imported vegetables, fruits, wine and meat. In sharp comparison, in order to compete we're trying to destroy our currency too. Compare and contrast the following. Don't expect too much contrast though. It's kind of like looking for a polar bear in a snow storm. Quantitative easing is often described as "printing money" -- although no new notes and coins are actually created. Has Bernanke Lost His Marbles? I'm terrified. It looks like Fed Chairman Ben Bernanke plans to run the printing presses until we run out of trees. Did Quantitative Easing by the Bank of Japan "Work"? While these outcomes appear to be consistent with the intentions of the program, the magnitudes of these impacts are still very uncertain. Moreover, in strengthening the performance of the weakest Japanese banks, quantitative easing may have had the undesired impact of delaying structural reform. Forget unintended consequences. We live in the era of undesired impacts. Thud! Thwack! That's just my forehead hitting my desk again. Let's fast forward 2 1/2 years and see how Japan is doing. TOKYO, March 24 (Reuters) - Corporate credit conditions in Japan remain severe, Japan's central bank governor said on Tuesday as he urged the country's banks to bolster their capital bases. The comments by Masaaki Shirakawa came after the central bank earlier this month offered more than $10 billion in subordinated loans to Japanese banks to bolster capital partly depleted by the slide in the Tokyo stock market. Japan's stock market peaked in 1989. That's 20 years ago. However, we still refer to at as The Lost Decade. The value of global equities has jumped more than $5 trillion in the latest rally. Japan’s Nikkei 225 Stock Average added 3.3 percent, extending its gain from a 26-year low on March 10 to 20 percent, the level indicating stocks have entered a bull market. Hong Kong’s Hang Seng Index climbed 3.4 percent, taking its surge since March 9 to 23 percent. All markets advanced except Malaysia. Does that look like a lost decade to you? As for the "indicating stocks have entered a bull market" theory, we've certainly heard that before. In a detailed analysis of stock-market rallies, Schwartz concludes that the 16 per cent rise over the past two months has all the hallmarks of a bull market. The size of the three-year fall, the number of consecutive days on which the market rose, and the speed of the rise have previously only occurred in bull markets. He said: 'History teaches that lengthy rallies often begin in response to an improved economic outlook, but some occur even though economic prospects look bleak. His prediction is echoed by other long-standing bears, such as Hugh Hendry of Odey Asset Management, who also thinks shares could rally sharply in the coming months. Longterm, however, he warns that the stock market could still fall below its recent lows. Great short-term call. Great long-term call. Hindsight is being very kind to him. Where's the wall of worry that bull markets are supposed to climb? I sure don't see it. In fact, I'm even willing to offer a "sure thing" theory in an attempt to explain it. The markets are simply trying to price in a drop in the dollar index from 89 to 77 (a 13% drop in the dollar, which in a rational world would drive up the price of most things by 13% eventually). If my theory is correct, then the markets have fully priced it in nearly twice so far. I would also add that the dollar index might not go to 77 (and even if it does, it might not stay there). Conventional wisdom seems to suggest it will, but conventional wisdom isn't always right. Anyone remember what happened last year? A weaker dollar has made U.S. goods and services more competitive in global markets. Is it any wonder that G-7 was concerned about the drop? I just don't think we're going to get off that easy. Using the benefit of hindsight, you will note that the dollar actually skyrocketed higher (see weekly dollar index in first link above). As counterintuitive as it might seem, I guess I am too. I believe that too. Here's one more link as a reminder. There has been speculation after recent speeches by Federal Reserve officials that the US Treasury is half-hearted in its declared strong dollar policy, and that the US favours a weak currency to help correct its huge current account deficit. We are empty-hearted and alone these days, but I strongly doubt we will be alone forever. Furthermore, within this framework, if a country tries to take advantage and depreciate its currency by means of a relatively looser monetary stance this runs the risk that other countries will do the same. Consequently, the emergence of competitive devaluations is the surest way of destroying the market economy and plunging the world into a period of crisis. I have four observations relating to this quote. First, this was said in response to our policies following the dotcom crash. It was not suggesting that the dotcom crash was the crisis but was instead predicting a future crisis. Second, the crisis came as predicted. We are now experiencing the biggest financial crisis since the Great Depression. Third, we are using these same currency devaluation policies again. Stick with what doesn't work apparently. Fourth, if history is any indicator, we'll get a nice rally (2003-2007) and then another hard crash at some point in the future. Enjoy it while it lasts. As for me, I'm content on the sidelines. INVESTORS are the obvious losers in this setup. Especially at risk are individual investors, according to a recent study by DPC Data. Obviously, when evidence emerges that a debt issuer is under stress, one would expect the price of its bonds to fall. And yet hundreds of trades of exactly this kind of debt were priced at par or higher, which Mr. Schmitt finds troubling. Other interesting details emerge in his study. For example, October was the biggest month for sales of distressed bonds to customers at par or premium prices. And 41 percent of the 667 purchases in distressed bonds appear to have been made by small investors, indicated by the size of each trade — $50,000 or less. What could I possibly say to do this justice? At 3.1 meters long, or about 10 feet, and 1.5 meters wide, the four-seater Nano's fuel efficiency is 5 liters per 100 kilometers, or 47 miles per gallon, and it has lower emissions than most two-wheelers in India, Tata says. Only 47 miles to the gallon? We better find more oil. If you hit a deer with the Nano, joked one commentator on the site, "you have to ride the deer to work." The fact that the Nano is here at all, though, proves the Big Three U.S. automakers wrong, Mr. Bhattacharya said. When he made presentations on the Nano to Western car manufacturers a few years ago, "they would all laugh and say that it couldn't be done," he recalled. It seems my laughter over the deer joke was short-lived. Sigh. Pay 12.5 million people $10 an hour to sit home all day and watch TV. * It would bring the unemployment rate down to 0%. * It would only cost 1/4th of a trillion dollars per year. * It would use very little crude oil. * It would not help us compete in the global economy. * It would not lay the groundwork for future growth. * Some current workers might choose to quit (unintended consequence). The plan only uses $260 billion dollars per year (12.5 million x $10 per hour x 40 hours per week x 52 weeks per year). That would still leave us with $740 billion of the trillion dollar deficit to fund the cons (pun intended). I'm not alone in thinking up new plans though. Tom Purcell has thought up an absolutely brilliant trillion dollar plan that puts my plan to shame. He's basing his plan entirely on unintended consequences and how we might game the system to make it work for us, instead of against us. Genius! It's unfortunate, but obvious, that President Obama and his team aren't sure how to unfreeze the credit markets. But, by applying the principle of "un-intention," it's suddenly obvious to me. Obama needs to establish a new presidential task force whose mission is to further freeze credit markets. We'll give the group a $1 trillion budget to spend any way it sees fit to reduce economic output, increase unemployment, cause more bankruptcies and so on. I'm confident the markets will thaw and the economy will boom inside of six months. I highly encourage you to read the entire article. He really makes a great case. It is extremely difficult to argue with his sarcastic logic. The bull market in sarcasm is really starting to squeeze me out. No matter how sarcastic my plans become, there's always someone else who can think up something even more sarcastic. You know what really scares me though? I'd like to think that my sarcasm is at least decent. Decent may not be good enough in the future though. Just think what would happen if a billion Chinese start thinking up their own sarcastic plans. What if 0.1% of them use genius level sarcasm? That's a million! I'll be squeezed out entirely. There's absolutely no way I can compete with that. Greenspan goes on to say "The U.S. economy's response to the terrorist attacks of September 11, 2001, is a case in point. That shock was absorbed by a recently enhanced, highly flexible set of institutions and markets without significantly disabling our economy overall. But that flexibility should not be taken for granted, and every effort should be made to preserve and extend it." What was our problem in 2001? Two very large office buildings collapsed. Lower interest rates to nearly zero! Borrow massive amounts of money! What is our current problem? The United States housing market is collapsing. The United States banking system is collapsing. What is our current plan? Lower interest rates all the way to zero! Borrow massive amounts of money! I originally posted this as a comment in response to MAB claiming that he was losing faith. After further reflection, I realized that this is actually the theme of my entire blog. I'm not saying it's a good thing. I'm just saying it's the only thing left that can get us out of our current financial system death spiral. To date the Fed has used every trick in it's toolbox without much affect. There's only one tool left that can pull off such a whiplash recovery; inflate and inflate with a vengeance. Because at this point academic debates over what constitutes “true market value,” and "mark to market accounting, are all very interesting, but way too late in coming. Lectures on good fiscal hygiene are useless now. It's time for steroids. Inflation with a vengeance does very much seem to be the current mindset. We're still experiencing deflation overall in my opinion, but once the remedy kicks in I strongly believe we're headed for stagflation (as is predicted in the article as well). I continue to believe that any recovery in our economy will be offset by an even bigger recovery in the price of oil. That will not be a good thing for us (or our stock market in inflation adjusted terms), not a good thing at all. LISBON, Feb 27 (Reuters) - The International Energy Agency fears that an expected recovery in oil demand from 2010 and oil project cancellations due to low crude prices and the credit crisis will mean no spare oil capacity at the end of 2013. The price of oil on that day was $44.15 and it was considered to be a low price. In 1998, we would have been shocked and horrified to see $44.15. I just want to point that out. He added that supply from producing oil fields will decline dramatically, and that to offset the decline by 2030 "we need 45 million barrels per day of new capacity, or the equivalent of 4 Saudi Arabias". I'm not a complete pessimist though. I was born in 1964. I consider myself very lucky. Had I been born centuries earlier, the appendicitis I had as a kid may have killed me. Had I been born decades earlier, I may have died in World War II. Had I been born years earlier, I may have died in Vietnam. In 2030, I'll be 66 years old. I probably won't have that much lifespan left in me by that point. By the looks of it, I won't be peaking alone though. Peak oil? Peak resources? Peak debt? Peak global population? Mad Max might not be fiction after all. What's driving up price of oil? "The government is basically printing money to buy back all this paper, and it devalues the dollar," said Phil Flynn, analyst at Alaron Trading Corp. Flynn said the rise in oil, however, shouldn't be taken as a sign that the economy is on the mend. He's preaching to the choir. There are at least three camps. 1. There is the camp that can look at stock prices and cheap energy for the past 100 years and extrapolate future prosperity. Let's call this camp the optimists. 2. There is the camp that can look at rising debt over the past 100 years and extrapolate future anti-prosperity. Let's call this camp the realists. 3. There is the camp that can look at rising debt over the past 100 years and also see that cheap energy is not something we can count on going forward. Let's call this camp the pessimists. When I turned bearish in 2004, I was firmly in Camp #2. I didn't care about the price of oil at the time. It was a side topic to me. At some point in the last few years, I became a believer in Camp #3 though. Here's a scary thought. What if we're calling Camp #3 the pessimists but history later shows that they were actually the optimists? Things are certainly much worse than I thought they'd be. Further, we're throwing trillions of dollars at the problems. Let's say the fundamental problem is a lack of future cheap energy though. Perhaps someone could explain to me how spending what's left of our prosperity on better roads will help to solve that problem? Ah, who am I kidding? A lack of future cheap energy cannot be the fundamental problem. At best, it is just one fundamental problem. There are plenty of other fundamental problems too and that is why I am a bear. Let's just cut to the chase. Plans and instructions for the bank’s contractors, on file with the city, specify the installation of at least one refrigerator and ice maker from the company Sub-Zero in the renovated space, along with ‘‘premium grade’’ millwork and Madico ‘‘Safety Shield 800’’ blast-proof window film. The project covers 17 private offices, each with space for administrative assistants, as well as two conference rooms and open areas with ‘‘soft seating,’’ according to the plans. $10 million would pay for 20 million man-hours of cheap Chinese factory labor (at a generous 50 cents per hour). I'm sure glad the Chinese are still willing to finance America's debt party. In the past, people would think twice about buying a luxury car to park in front of an inexpensive house. Luxury cars are expensive. That's old school thinking though. In the present, if people need to borrow $500,000 to buy a home, then what's the harm in borrowing an additional $50,000 to buy a luxury car to park in front of it? It's just a small percentage of the total borrowing. Similarly, what's $10 million when you are getting $45 billion? Chump change I guess, and as a taxpayer I sure feel like the chump. I put my portion of the bailout at $150 ($45 billion / 300 million Americans). I'd like to claim part of the Sub-Zero purchase as my own, since Sub-Zero is where the stock would be trading without my help. Sounds pretty good these days, doesn't it? The price of a first-class stamp will go up by 2 cents to 44 cents on May 11, and several other rates will also go up. The Forever stamp will continue to cover the price of a first-class letter, but it will also rise in price when the rates go up. Simply buy the forever stamps before May 11th and then use the stamps any time in the future. That's a 4.76% return the first year and you won't ever have to pay tax on it. Heck, there's a decent chance that returns in future years might even be higher. Who knows! Here's an arbitrage strategy. Sell your 3-Month Treasury Bill yielding 0.19% and use THAT money to buy the stamps. It's a 4.57% differential. Genius! Still not convinced? It would take a whopping 25 years to earn a total of 4.76% interest at today's 3-Month Treasury Bill rate and that even assumes you'd be paying no taxes on that interest. The Fed decided that printing money was the best solution to our problems yesterday. Let's not forget that they can repeat the solution as many times as they like. A trillion here and a trillion there and pretty soon we're talking about real money. A guaranteed 4.76% tax-free return, that's what I'm talking about. The person in front of me at Costco actually wanted 200 stamps versus my meager 100 stamps. Maybe she's just starting her hoard though. Get out the disco balls. It's party time, again. I wish I could tell you that the 4.76% return actually makes us a profit. It doesn't. All it does is save a small part of our nest eggs from future inflation. That's not quite the same thing. In the end, we will have paid for a stamp and we'll have a stamp. We won't be any better off. I'll take it though. In fact, I wish the government sold forever groceries, forever gasoline, forever electricity, forever natural gas, forever healthcare, and forever property taxes. Unfortunately, their biggest offering seems to be forever debt. I wish I could say that I could avoid it, but I'm both a taxpayer and a holder of government TIPS and I-Bonds. I'm neck deep in the stuff. Sigh. But the current environment naturally leaves a beginner confused about how to invest. The tough housing market means real estate looks cheap, but it's also an unreliable investment. After the financial market's problems of the past year, the same can be said for stocks, bonds, and other investments. Are they a bargain or a dangerous trap? At the same time, the financial crisis and widespread layoffs seem to argue for playing it safe. But how much cash can really fit into your piggybank or under your mattress? Trillions of dollars can be placed under your mattress. Here's a list of the things you will need. 5. Access to a @#$%load of $100,000 bills (see link below). The first four items are relatively easy to obtain. The last one will require you to have connections within the Treasury or the Federal Reserve, and/or have access to a backyard during one of the many paper money helicopter drops. Barring that, you can also hope that the government will print that denomination at some point in the future, say if inflation picks up. Under cover of darkness, use the wheelbarrow to move the money to the armored car and then park the car in your garage. 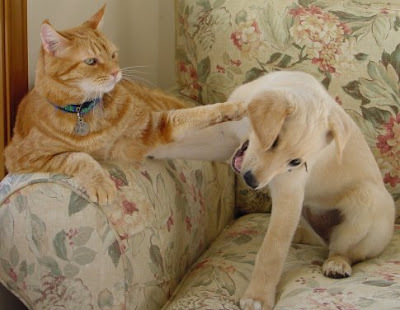 Shut the door and your mouth. Loose lips sink ships. Congratulate yourself. The hard part is done. Dig a hole under your mattress with the shovel. You will need to dig a very big hole. This may take more than one day. Don't get discouraged. Just keep digging. Dispose of the dirt slowly through a pant leg as you take walks around your neighborhood. You don't want anyone to think you've been digging. Once you are done, use the wheelbarrow to safely transfer the money from the armored car to the hole. Once that step is completed, cover it with the TARP. You are now safe from the financial storm. As long as all that faith-based paper currency retains its value over the long-term, you've got nothing to worry about. Well, almost nothing to worry about. Don't leave the room. Brace the door and prepare for looters. Other cash hoarders may not be as careful as you. Once looters realize that someone has trillions of dollars stored under their mattress, they might rightly supsect that everyone does. What was the largest currency denomination ever produced? The largest denomination of currency ever printed by the Bureau of Engraving and Printing (BEP) was the $100,000 Series 1934 Gold Certificate featuring the portrait of President Wilson. These notes were printed from December 18, 1934 through January 9, 1935 and were issued by the Treasurer of the United States to Federal Reserve Banks only against an equal amount of gold bullion held by the Treasury Department. The notes were used only for official transactions between Federal Reserve Banks and were not circulated among the general public. Backed by gold bullion? Those were the days. I saw that the stock market was up again today. The real shocker was what happened to my "super-safe" Treasury Inflation Protected Securities fund though. I have never seen anything like it. Up 3.7%? In just one day? Super-safe funds should not move like this. That's when I looked to see how its non-inflation protected counterpart was doing. Holy death of real yields batman! NEW YORK (CNNMoney.com) -- Treasury prices surged Wednesday, after the Federal Reserve said it would buy up to $300 billion in long-term Treasurys - a move the central bank has hinted at for months. The Illusion of Prosperity's ever popular Death of Real Yields series will soon be back in action it seems. The Fed is targeting savers in a major way. What took them so long? The time for saving long-term was yesterday it seems. For those still waiting on the sidelines in 0.2% Treasury Bills, I feel for you. Today's long-term savers just got a 3 1/2% haircut. I have added red arrows to help us know when the worst is over. Contrary to popular opinion, the third time was not the charm. Nor were the fourth or the fifth times apparently. So what does this mean? I-Bond rates reset on May 1st. I'm buying this year's batch before that point. 0.7% over inflation, although lousy, is good enough. At least it is tax-deferred. I don't feel the need to be a hero. 0.0% is a distinct possibility, again. Well, I have been saying that 1.2% wasn't all that bad in comparison to what I thought was coming next. I never dreamt of 0.0% though. Wow. That makes it absolutely impossible for the I-Bonds you buy today to keep up with inflation unless you can find a way to pay zero taxes once you cash them. Good luck on that one! So what else could this mean? This picture is worth at least a thousand words. When real yields fall, some savers will hoard hard assets instead of cash. Hoarding hard assets during a period of economic weakness is consistent with my long-term stagflationary outlook. It seems that every day companies are retreating from their 401(k) commitments. More than 120 companies have announced a suspension of their match within the past nine months, according to the Pension Rights Center. "Since the fall, a whole slew of corporations have suspended their 401(k) match," said Dan Muldoon, a research associate for the Center for Retirement Research at Boston College. "We experienced the same situation during the last recession between 2000 and 2002. It's a way to trim the budget without having to lay people off, so it's seen as a lesser of two evils." When times are good and the stock market is high, the match allows us to buy overpriced stocks. When times are bad and the stock market is low, the missing match allows us to avoid buying underpriced stocks. Corporate America is always looking for new ways to make us prosper. His advice? Direct new savings first into an emergency fund. In today's economy, with layoffs rampant and your employer signaling financial vulnerability, every household should have three to six months' worth of living expenses set aside in a liquid, interest-bearing account such as a money-market fund. In today's economy, new savings should apparently be directed towards the safety of relatively low rates of interest. There's no need to buy underpriced stocks. This implies that we were supposed to do something different in yesterday's economy. I can only assume that with layoffs not rampant and employers not signaling financial vulnerability, households were supposed to buy overpriced stocks and avoid safety even as banks paid relatively high rates of interest. Perhaps the best time to create an emergency fund is actually during the good times? That way the emergency fund could actually be used during the bad times? I know. It sounds like a really crazy theory. As a side note, any idea what would happen to our economy if every household suddenly decided to stockpile three to six months' worth of living expenses? Four-in-ten workers (41 percent) say they often or always live paycheck to paycheck, according to CareerBuilder.com's latest survey. We're told that our society should save more. Because workers' paychecks are often spent before they even hit the bank, saving is often not an option. Then I guess we're in big trouble, but we kind of already knew that. His predictions don't seem that irrational to me. Here are the predictions of my gut. 1. Oil will outpace the stock market during a recovery. We saw this during the last recovery and we are seeing it now. When the stock market rises, the price of oil rises more. The reason we are seeing it, at least in my opinion, is because there is no clear cut growth engine other than things that burn oil. We don't have an illusion of an energy efficient dotcom bubble to chase any longer. Future bubbles seem to be based on building things (in China) and then powering them (in China). 2. At some point, the rising price of oil will cause everything to come crashing back down again. The first problem is that the Fed needs to inflate or die. The second problem is that all things do not inflate equally. The third and most important problem is that the inflation of some things causes serious economic pain. Maybe I just watched too many Mel Gibson movies. That's what my gut thinks though and why I can remain a stagflationist long-term even though deflation has arrived. Note that the price of oil bottomed at $30.28 on December 23, 2008. That's actually a 62% increase. In sharp contrast, the S%P 500 is a mere 15% off its March 9th bottom. I was not a believer in a long-term commodity based stock market rally in 2004. I'm not a believer now. We may indeed have an impressive stock market rally from here, but I doubt very much that it will usher in a new permanent round of prosperity. There is just too much money floating around out there in the hands of the uber rich and at least some of it will be willing to chase oil again. The oil market is way too small to absorb it, just like it was last time. Allow me to do some "crude" back of envelope calculations to show you what I mean. At $50 a barrel, that's $300 million per day. In theory, a $700 billion stimulus plan could therefore pay for 6 1/2 years of imported OPEC oil. In practice, the price of oil would rise exponentially as the money was spent though. Too bad. Free oil for every American for 6 1/2 years would have been one heck of a stimulus. Want to guess how many years of imported OPEC oil the $50 trillion that was lost during this global recession could have bought us? Try 456 years. Once again, that's just in theory though. I'm fairly confident that we couldn't have bought 456 years worth of imported OPEC oil at any price. That's how small the oil market is when billions and/or trillions of US dollars attempt to compete with it. That's why I am comfortable being a long-term stagflationist. And when I say comfortable, I actually mean terrified. It's almost like we are letting the terrorists win. Since 2001, our economy has faced a recession, the bursting of the dotcom bubble, major corporate scandals, an unprecedented attack on our homeland, a global war on terror, a series of devastating natural disasters. Our economy has weathered every one of these challenges and still managed to grow. On September 19, 2008 the S&P 500 closed at 1,255.08. After the past week's impressive rally, it closed today at 778.12. That's a 38% loss. I know this may be a silly time to think about it right now, but I do. It is the price of oil that makes me wonder. It is holding up extremely well especially if the near global depression is factored in. To put today's nearly $50 oil price into perspective, it averaged under $20 a barrel during the booming 1990s. These may sound like drastic solutions, but as Graedel points out in a paper published last year (Proceedings of the National Academy of Sciences, vol 103, p 1209), "Virgin stocks of several metals appear inadequate to sustain the modern 'developed world' quality of life for all of Earth's people under contemporary technology." 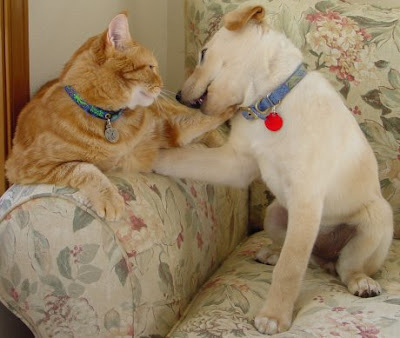 And when resources run short, conflict is often not far behind. It is widely acknowledged that one of the key motives for civil war in the Democratic Republic of the Congo between 1998 and 2002 was the riches to be had from the country's mineral resources, including tantalum mines - the biggest in Africa. The war coincided with a surge in the price of the metal caused by the increasing popularity of mobile phones (New Scientist, 7 April 2001, p 46). I remain a stagflationist long-term, but I could be wrong. We did come up with one solution that seems to be working so far though. Bravo, well done, and quite a relief. But enough to signal an end to the 17-month capital attack that has blown up $50 trillion in market value and blistered many investors' professional reputations? Not a chance, as well-armed bears in police uniforms are just itching to give out tickets to investors trying to break the laws of financial gravity. I'm sittin' in the choir while listening to the sermon. Can we get an Amen? Amen! Catalysts for the rally were patently absurd. The kickoff event last Tuesday, March 10, was an announcement by Citigroup (C, news, msgs) that it had earned a profit in the first two months of the year -- as long as you don't count loan write-offs or other losses. That's like saying Death Valley is temperate except for the heat. I certainly can't compete with that level of sarcasm today. The FASB's proposed guidance would stop short of changing the mark-to-market rules, but it would clarify how auditors should unterpret those exisitng regulations. It would allow banks and other companies that have had a difficult time valuing illiquid mortgage and other securities, the ability to use "significant judgment" when valuing the assets. "Unterpret" those "exisitng" regulations? Seriously? Freudian slip meet spell checking nightmare. I must say that unterpret seems a pretty good word to describe an illusion of proper accounting though, lol. That being said, it just doesn't seem right to me that the banks would be allowed to use significant judgment when they clearly have a history of showing poor judgment. That combination could end up creating some significantly poor judgment and why I propose two alternative ideas. The government could simply step in and buy all assets, troubled or otherwise, or even just credibly threaten to do so. Dow 36,000 here we come! Sure, the government would need to take on debt to do it. However, think of all the assets the government would then own. As an added bonus, we'd all be government workers. Let's bring the full power of the Department of Motor Vehicle efficiency technology to every aspect of our lives. Prosperity, baby! Genius! Since the tension between social classes is deemed to be the cause of political unrest, Marxism attempts to solve this problem by establishing public ownership as its dominant feature. The government could create Zombie banks and give them the ability to create Zombie loans exponentially. This could ripple through our entire financial system until everything is undead. It's basically what we have now but at least we'd know what to call it. Authorities are slow to respond to the threat giving the zombies time to grow beyond containment. The zombies cannot be controlled despite the broad choice of countermeasures with available technologies. This outcome then results in the collapse of the given society. Zombies take full control while small groups of the living must fight for their survival. I know. It sounds far-fetched. It would take someone with poor judgment to support this plan of course. Let's see. Do we know anyone who might meet that criteria? American bankers are fighting — for the right to be zombies. I watched Ben Bernanke's interview on 60 Minutes last night. I thought he did a pretty good job overall. I'm not going to comment much more on that though. I was more amused by the reaction to it. I flipped on CNBC this morning. They thought he did well too. They also told me to make no mistake though. Bernanke's talk was intended for the general population and not the typical CNBC audience. I nearly lost it in a fit of hysterical laughter. Seriously! They sure got that right. Ben Bernanke talked to the interviewer in a calm and relatively relaxed environment about the serious issues our country is facing right now. There was no screaming. There was no array of sound making devices for him to push every time he made a point ("Mad Money"). The were no "Boo-yahs!!!" There was no lightning round. And lastly, from what I could see there was very little crappy advice, lol. Cramer: Let's start with Nicole in California. Nicole! Nicole: ...Boo-yah to you Jim! Nicole: Thanks Jim. Thanks for taking my call. Thanks for the book. Thanks for the show. Love everything about you. Cramer: Thank you. Wow, really? We're out there September 7th at USC if you want to check out the merchandise. Cramer: I mean, you know, like Real Money, the books. Cramer: All right. Go ahead. Nicole: Is Caterpillar still going to 120? ...this weekend while I was sipping on some real cheap vino because I can't even afford Scotch any more I went over line by line the Caterpillar quarter, the Caterpillar press release, and the Caterpillar conference call and you know what? It was really a pretty good quarter and I wish I hadn't talked about it so I could have bought more for... I URGE you to buy that. I see a big upside surprise. I'd pull the trigger.... Caterpillar's DONE going down! Cramer: How about Joanne in Arizona? Joanne! Joanne: Hey Jimmy! A big hot and steamy boo-boo-boo-boo-yah from the valley of the sun. Cramer: Holy cow. I wish I were in the valley of the sun. I'll spare you the details. Hopefully you assumed that the Caterpillar advice wasn't the worst. It was simply the first. 2 Year Chart of Level 3 Communications Inc.
You can't wait and then buy it. You have to keep in it now! 2 Year Chart of Allscripts-Misys Healthcare Solutions, Inc. Here's a comment someone left on YouTube. That reminds me. I did not have a seizure last night watching 60 Minutes. Once the debt crisis is over, we must then tackle the debt crisis. Genius! Thwack! That's just my forehead hitting my desk. Sorry. He said there was "one ineluctable lesson of the history of financial crises: They all end." Why would anyone be trying to avoid or escape the ending? Hold on. How will this crisis eventually end? He seems to have left that little detail out. I sure hope it doesn't involve me hauling money to the grocery store in a wheelbarrow just to buy a loaf of bread. Thwack! Thud! Thud! Thud! They should also "remember this central paradox of financial crisis: that while the problem was caused by excessive complacency and excessive optimism, what we need today is more optimism and more confidence." 1. ...to expect the most favorable outcome. Here's something I posted back in 2007. I consider it to be one of my most important charts. This one really gave me an epiphany. Perhaps it will do the same for you. 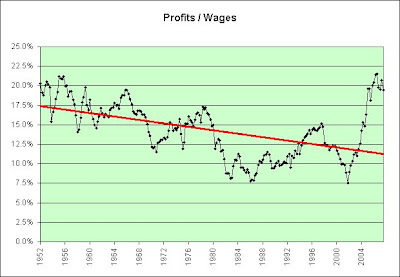 This chart shows the total domestic financial, farm, and non-financial corporation profits (before taxes) divided by the total compensation of employees. How long will it be before we return to the red trend line? Or is this a new permanent era of prosperity? Note that the long-term trend is down. I believe I can offer a simple explanation for that. I would think that in a capitalistic society, competition would eventually squeeze the life out of all profits. If money can be made, someone will figure out a way to extract it. If a lot of money can be made (like right now it seems), MANY people will find MANY different ways to extract it. You know, just like homebuilders in California once were. Build them fast and sell them even faster! I excluded the profits made off the "rest of the world" primarily because I'm interested in how our domestic economy is doing. Right now it is doing absolutely fantastic. Just look at all those fat profits ripe for the picking. 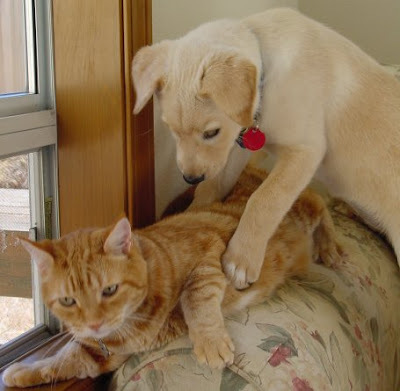 You'll excuse me if I wait until the bottom falls out first though. I'm no thrill seeker these days. Here's an updated chart using the most recent Flow of Funds data. I offer three observations for stock market investors. Keep in mind they are just my opinions though. 1. As predicted, we are clearly heading back down towards the red trend line. There really was no other choice. As seen above, that's the way capitalism must work. Fat profits that are that ripe for the picking will be picked repeatedly until they are gone (one way or another). 2. The red trend line is down. That's actually something that Karl Marx predicted. He claimed that capitalism would eventually squeeze all profits to the vanishing point. In 2007, I was just trying to make sense of the chart. I didn't realize at the time I was actually backing his theory. 3. The line represents the average trend. By definition, we must spend as much time below an average as we spend above an average. That would imply that there's a decent chance we won't conveniently stop once we hit the line. It is not outside the realm of possibility that we drop to 7.5% on the chart. We've done it before. We're at 13.6% right now. That's a long ways down. It is also not outside the possibility that we drop even further than that. First, the trend is down. Second, the bigger the climb the bigger the fall. As seen in the chart, it was a very big climb. We certainly spent a lot of time well above the average. Any one of those points would scare me away from the stock market, even at these supposedly bargain basement prices. The combination is brutal though. I just don't need the risk. The sidelines have been treating me very well and I'm quite content to stay here. I certainly have no desire whatsoever to bottom feed ABOVE the trend line. Note that I haven't even mentioned debt yet. That's what originally turned me bearish. I thought we were trying to borrow our recovery. I think you can see how well that worked out by simply looking at the chart from 2004 to 2008. It felt good to borrow the money and then it didn't feel so good. Big shocker. Are we better off than we were in 2004? I would argue that we are worse off. Most of that debt we threw at the problem back then is still with us. Meanwhile, our stock market is much lower and our unemployment is much higher. Using debt to solve our structural problems didn't work long-term the last time we tried it so of course we're going to try borrowing again in a much bigger way. That pretty much goes without saying. Warning that 2009 will be a "very dangerous year", he said state stimulus alone would give only a short-lived economic boost that would soon evaporate unless credit flowed again. Perhaps what we need is stimulus that initially covers a wide area of effect but can also provide economic boosts consistently in the future. While all weapons are potentially dangerous to civilians, cluster bombs pose a particular threat to civilians for two reasons: they have a wide area of effect, and they have consistently left behind a large number of unexploded bomblets. The unexploded bomblets remain dangerous for decades after the end of a conflict. Behold the cluster debt bomb. Serious stimulus baby, that's what I'm talking about. I have gone through the Fed's Flow of Funds report today and offer you the following chart. It's two ways to look at the exact same data. The data is drawn from Table L.100 Households and Nonprofit Organizations. Deposits are taken from line 2 of the table. Credit Market Assets are taken from line 7. They consist of treasuries, savings bonds, municipal bonds, corporate bonds, and other forms of household savings. Credit Market Liabilities are taken from line 25. They consist of home mortgages, consumer credit, bank loans, and other forms of household debt. For the optimists, I offer a blue line version of the data. It shows the increasing leverage over the years as a ratio between credit and savings. 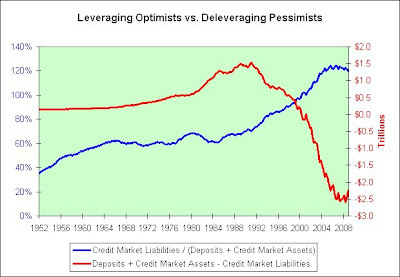 Optimists might say, "Credit is the life-blood of our economy. That blue line clearly needs to start going back up again. Only then can things return to normal." For the pessimists, I offer a red line version of the data. It basically shows savings minus debt. They might say, "Saving is critical. That red line clearly needs to go back up. Only then can things return to normal." As seen below, I think it is safe to say that our political leaders have embraced both versions. They have plenty of practice talking out of both sides of their mouths though. “Saving is critical,” Bernanke said in response to questions after a speech at Montana Tech. Credit: "The Life-Blood of the American Economy"?! Yes it has finally come to this... The "experts," the politicians, the corporations, and the financial community are beating their chests for even more bailout credit, deeper debt, more government spending and larger loans. I can't stand hearing this soundbite of stupidity, yes even from the Chairman of the FED!! When did credit... when did owing other people even more money become the Life-Blood of the American Economy?! It's the United States Country Fair. Step right up. Everyone is a winner! All you need to do is simultaneously save more AND borrow more. Barring that seemingly impossible task you can also win a prize by simply tossing a "quarter" of your earnings onto the wobbly glass plates. If it manages to somehow stick, we'll give you an 800 pound stuffed gorilla! While the downgrade of its credit rating, in and of itself, would generally be considered a demerit for a company such as GE, which lost its standing as one of just six non-financial companies with an AAA-rated debt, the downgrade wasn’t as severe as some GE watchers had feared - it was cut one notch to AA+, instead of the two- or three-notch decline that some investors braced for - and had been widely discounted in a stock that traded aat a 13-year low earlier this month on exactly those worries about a hit to its credit rating. And, for all intents and purposes, credit-rating agency calls these days have become regarded as lagging, not leading, indicators. S&P might have been about the only institution out there that regarded GE’s debt as triple-A quality as recently as Wednesday. Why would anyone even care what the rating agencies think of GE's debt? These are the same rating agencies who assigned AAA ratings to subprime debt. The theory seemed to be that if toxic assets were properly bundled then they could be pressed into fine wine. Just imagine what Benjamin Franklin would say if he was still alive today. Actually, you might not need to imagine it. We live in an era of falseness. Of that I am fairly certain. Just look at that first headline. We're having a rally based on a ponzi schemer, a debt downgrade, and a potential accounting rule change that can make at least some of these toxic assets magically vanish. Let's not stop there though. A more aggressive accounting rule change could turn these toxic assets back into the appearance of fine wine again. That could lead to an actual debt upgrade and even more ponzi schemers! Hurray! 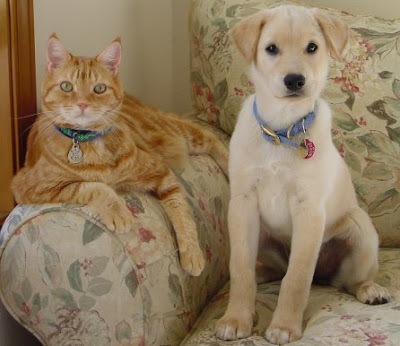 Using the benefit of hindsight, I think you can see that our cat Tigger and our dog Honey clearly did a pretty darned good job acting out the future back in 2007, but conditions have changed. They now offer you an expanded director's cut version of the show. The economy is broken. All eyes are on the Fed. The Fed slashes interest rates. 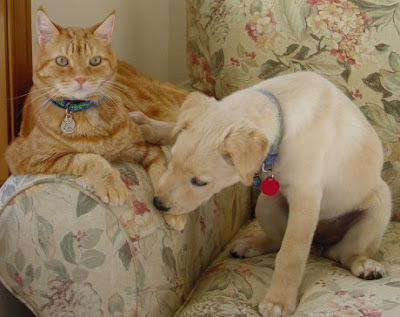 The fat cat continues to watch the Fed as the happy dog begins to show some signs of life. As business begins to pick up the fat cat is more than happy to offer cheap products to the happy dog and a certain balance is achieved. 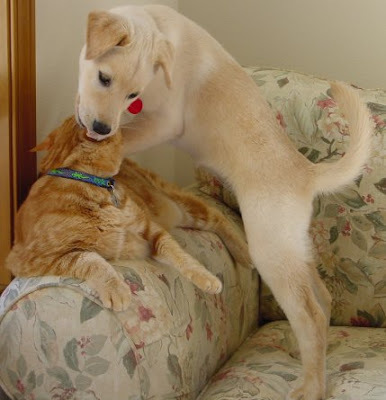 Cost pressures begin to mount for the fat cat and are transferred directly to the happy dog in the form of higher prices. The Fed, seeing the struggle, opts to raise interest rates. Cost pressures continue to climb for the fat cat. Portion sizes are reduced on happy dog's food in hopes she won't notice. Unfortunately, she notices. The Fed raises interest rates further. As prices continue to spiral higher, so does the happy dog. The Fed panics and continues to raise interest rates to contain the problem. The happy dog has had enough and begins to lose her brand loyalty. 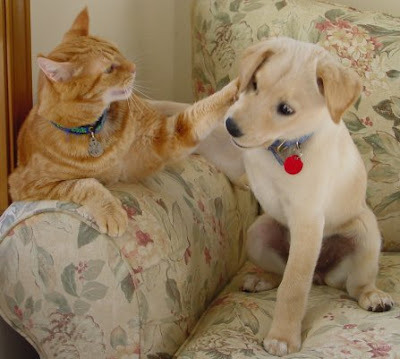 She calmly explains to the fat cat that she will be buying generic food instead. In response, the fat cat rushes off to explain to the shareholders that the unseasonably warm winter has caused the company to miss its numbers. The Fed, upon seeing the cost pressures begin to recede and noting the warmer winter, is satisfied that the economy is once again in balance. Meanwhile, the economy crashes. The economy is broken. The Fed slashes interest rates but nothing happens. All eyes are frozen on the Fed. The economy is broken. Treasury Secretary Henry Paulson announces a Troubled Asset Relief Program (TARP) that doesn't actually end up buying many troubled assets. All eyes are frozen on the Treasury. The economy is broken. We finally elect a new president. President Obama tells us that if a stimulus package is not passed "our nation will sink deeper into a crisis that, at some point, we may not be able to reverse." All eyes are frozen on the President. The economy is broken. We finally have a new Treasury Secretary. Treasury Secretary Timothy Geithner unveils a cunning plan to fix the economy that was months in the making but ends up being amazingly short on details. All eyes are frozen on the Treasury. The economy is broken. Congress finally passes a massive stimulus program that borrows massive amounts of money from the taxpayers to bail the taxpayers out. All eyes are on frozen on Congress. The economy is broken. President Obama tells us that although we clearly can't restore fiscal discipline right now, restoring fiscal discipline at some point in the future will be very important. All eyes are frozen on the President. The economy is broken. House Speaker Nancy Pelosi tells us that Congress needs to "keep the door open" to another stimulus package. It may be necessary to borrow even more massive amounts of money from the taxpayers to bail the taxpayers out. All eyes are frozen on Congress. The economy is broken. All eyes remain frozen. This concludes Act II of the play. There will be a brief intermission to finish the production of Act III and rest the eyes of the actors. That "frozen in the headlights" look takes more energy than it might otherwise appear. In the meantime, cocktails will be served in the lobby. As part of the current stimulus package, all drinks are on the house! You say alcohol isn't actually a stimulant? It's a depressant? Look buddy, if it's in the stimulus package then it is a stimulant. Okay? Stimulants cannot lead to depressions. Don't go looking for trouble.